The Aging Life Care Association October meeting will have Dr. 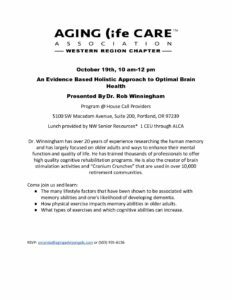 Rob Winningham presenting on an Evidence Based Holistic Approach to Optimal Brain Health. The program will be in the House Call Providers conference room with a sponsored lunch by NW Senior Resources. -The many life style factors that have been shown to be associated with memory abilities and one’s likelihood of developing dementia. -How physical exercise impacts memory abilities in older adults.